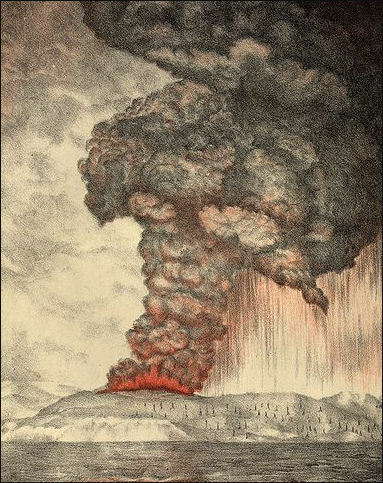 Krakatoa eruption lithograph Krakatoa, an island volcano west of Java, exploded on August 23, 1883. The blast was equal to 3,000 Hiroshima-size atom bombs, 26 times more powerful than the strongest hydrogen bomb, and 18 times more powerful than the Mt. St. Helens blast. 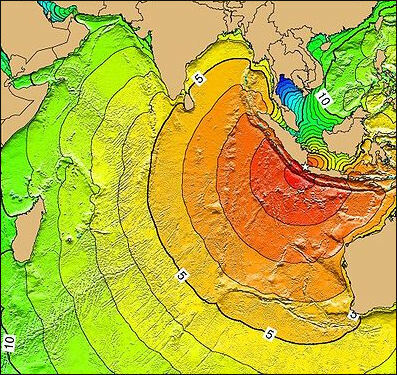 Tsunamis as high as 100 feet were created. Eleven cubic miles of debris was sent flying into the atmosphere. The most powerful explosion was twice as strong as the largest nuclear blast. It hurled pumice 34 miles into the air that fell 3,313 miles away 10 days later. Winds from the blast circled the earth seven times before they died down and waves escaped from the Indian Ocean below Cape Horn in the Atlantic and radiated into the English Channel, 11,500 miles away. The noise was the loudest in recorded history. It was heard distinctly in central Australia 3000 kilometers away. Five thousand kilometers on the small island of Rodiguez "the roar of heavy guns" was heard and a captain ordered his ship out to sea. By some estimated the blast could be heard over one thirtieth of earth's surface. Some people in Texas claim they heard the sound. Five cubic miles of ash was thrust into the air. Ash fell as far away as New York, and humans bones were carried 4,500 miles across the Indian ocean to Zanzibar. So much ash was thrust into the stratosphere the color of the sun turned green and temperatures around the globe dropped several degrees, producing blizzards in the midwestern United States in July. On the positive side, brilliant sunsets lingered for years all around the world. 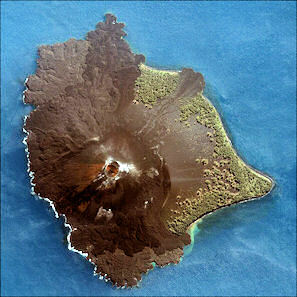 At one time Krakatau was a massive island with a towering volcano over 6,500 feet high. The Javanese Book of Kings describes an explosion in 416 A.D., that bore an uncanny resemblance to the 1883 eruption only it was probably more powerful. The entire island was obliterated and villages on the coast of Java and Sumatra were swept away by giant tsunamis as they were in 1883. All that was left were three barren islands that formed around the caldera of the former volcano. One of these is islands, Rakata, began sprouted a volcano not long after the 416 eruption. Over the course of about 1,200 years two more volcanos, Danan and Perbuatan, emerged from the sea and joined Rakata, creating a 17 square mile island roughly 5 miles long and three miles wide. In 1680 a major eruption occurred that left the island burned and barren according to a passing ship. After this the volcanos were quiet for two centuries. In May 1883 Danan and Perbuatan began emitting ash and three months later in August the climactic eruption occurred that shook the world like no other. The first hint of the impending disaster occurred at 10:55am on May 22, 1883, when a German naval ship noticed a huge cloud emanating from Krakatoa. The captain estimated the cloud climbed seven miles into the sky. The plume was accompanied by flashes of volcanic lightning and showers of yellow ash. The cloud eventually dispersed, but later two more enormous clouds were observed, one on June 16 and another in early July. The main eruption began at 1:06pm, August 26, 1883 when a huge cloud of steam, gases and volcanic debris pushed 35,000 feet into the air. Millions of people heard the blast and an 150 square mile area was thrust into a darkness that lasted for three days. Krakatoa Tsunami, 1883 Ash, pumice and lava blocks were hurled into the air. Huge of rafts of pumice were created in the sea. The subterranean chamber from which the material was coming slowly emptied. The rock roof of the chamber, with nothing to support it, collapsed. Millions of tons of water fell on the melted lava in the chamber and three quarters of island (11 square miles, or an area almost the size of Manhattan) fell on top of it. The result was an incredible explosion at 10:02am on August 27, some 22 hours after the eruption began. The explosions continued and after 3:00pm they were occurring every two minutes. Huge waves hit the shores of Sumatra and Java at a rate of one every 15 minutes. Some coastal towns were showered with ash and debris. Others were thrown into chaos as residents fled their homes to try and reach higher ground as the massive waves pushed inland. Ships at sea bobbed up and down in the huge waves but otherwise they were not damaged. Ash rained down on the decks of ships and electric flames played along the rigging. The Berbice , only 15 miles from Krakatoa, received a shower of ash that piled up three feet on the deck of the ship. Map of Krakatau The Krakatoa explosions and the tsunamis they generated killed 36,489 people, decimating 165 villages and nearly destroying 132 others. Most of those killed were carried away and drowned by tsunamis. Victims washed up months later as far away as the east coast of Africa. Villages were swept off the face of the earth. A naval gunboat was heaved up to two miles inland by the awesome waves and deposited on a hill. Boats that cruised the waters around Krakatoa after the disaster found the corpses of humans and tigers floating in the sea. A Dutch administer in Sumatra saw a wave lap against his house and remove flower pots from his veranda and a town with 800 people below it. A fisherman on Java was swept inland several miles and kept himself from drowning by holding on to the back of a crocodile which he first thought was a log. A reminder of the destruction, which can be seen today, is a huge one-ton iron buoy that was thrust onto a hill a mile inland near the Sumatran town of Telukbetung. After 1883 eruption all that was left of Krakatoa were the same three islands that emerged after the 416 A.D. eruption, only their shape had been altered. The largest of these islands was called Rakata. In 1969 Hollywood made a Cinerama movie about the eruption called Krakatoa, East of Java . The volcano was actually west of Java. Producers said that they were aware of this but they chose the name because it sounded more exotic. In the film the volcano was made of polystyrene. Krakatoa eruption, 2008 The islands of Krakatoa were completely sterilized by the blasts. Areas with rich rain forests were replaced by barren wasteland. In some places the ash was heaped in piles 200 feet thick. In 1884 all that could be found on Rakata was one microscopic spider. But it didn’t take long for life to return. The first organisms to arrive were blue-green algae and ferns germinated from wind-borne spores. Next came grasses. Within three years 28 plant species had established themselves. In 1888, a large monitor lizard was spotted. Rakata is about 30 miles from Java and most of the life forms were transported to the island by the sea (seedlings implanted in floating logs), wind (seeds and spores that light enough to float in the air) and animals (that could fly, swim or somehow hitchhike a ride to the island). Scientists observed many pieces of driftwood washed up on the beaches. Within 40 years nearly 600 animal species had arrived, including rats, geckos, pythons and blind snakes. Pythons swim but blind snakes don't. Blind snakes like termites and it is believed they hitchhiked on a peice of termite-filled driftwood. Rats and geckos probably arrived with humans. Scientists have studied these islands to see how life establishes itself again. By 1930, forest completed covered the island. Many of the open land creatures that disappeared in the eruption were replaced by species that thrive in a forest environment. Today the islands are completely covered with forests and new species of butterflies, birds and reptiles are still arriving. Anak Krakatau (child of Krakatau) is a small, extremely active volcano that rose from the ocean from the remnants of Krakatau and disappeared five times before it established itself as a permanent island in 1930. Situated in the middle of a huge submerged caldera and approximately 300 feet high, the island was created after Krakatoa collapsed during the famous cataclysmic eruption of 1883. Anak Krakatau Anak Krakatau has been very active since 1972 but tourist boats still take people there. I talked to a group of travelers who went there and walked up to the crater which, at the time, was quiet. While they were standing there the mountain started to erupt and the they had to dash for their boats while fist-size volcanic bombs plummeted around them. On Anuk Krakatoa are thickets of casurina and wild sugar cane as well as jumping spiders, blind snakes, collared kingfisher, mature fig trees (that don't fruit because their wasps aren't present). Many of these creatures are believed to have arrived by driftwood. "By the time we reached the volcano's outer lip it was deafeningly noisy. It was erupting rhythmically at about eight-minute intervals which were preceded by two separate and terrifying sounds. First as the whole island trembled like jelly...This was followed by the bowling alley racket of stones and boulders ricocheting off the walls of the crater as they ascended from a great depth to gush out over our heads in billowing clouds of debris and smoke. Our equipment, clothes and bodies were penetrated by the finest, hardest black dust. Every so often a football-sized boulder would thud in the ash nearby. "With each blast came a drizzle of hot stinging ash...We had difficulty breathing, our hair stood on end...Here at the site of the most devastating explosion in human memory, we wished to demonstrate both the unity and fragility of the earth by blowing soap bubbles across the crater." The island- group along with its marine environment was declared by the Dutch Colonial government as a nature Reserve since 1919, encompassing a total area of 2.405,10 hectares. The Krakatau Islands were later in 1984 incorporated into the Ujung Kulon National Park located on the western part of Java. In 1990, the Directorate General for Forest Protection and Nature Conservation of the Ministry of Forestry assigned the management of the Krakatau Islands Nature Reserve to the Balai Konservasi Sumber Daya Alam or the Natural Resources Conservation Office of Lampung, on Sumatra, with the aim to protect and preserve its integrity as an important conservation site for science and education. In the same year the nature reserve was expanded by the Ministry of Forestry to cover the total area as known today. In 1991, UNESCO acknowledged both Ujung Kulon National Park and the Krakatau Islands Nature Reserve as an integrated UNESCO Natural World Heritage site. 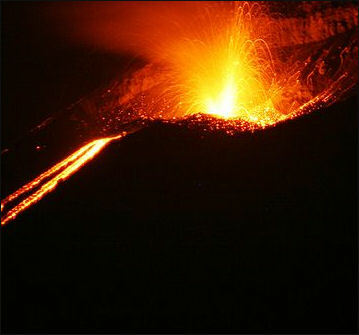 Krakatau is also commonly known in the English-speaking world as Krakatoa. This may have been attributed to a sub-editor at “The Times” who may have typographically swapped the 'a' and 'o' of the Portuguese spelling as he interpreted a telegraphic report on the massive eruption of 1883. Furthermore, the 1969 Academy Award nominated movie, “Krakatoa, East of Java” — which is geographically misleading— also aided in popularizing the Krakatoa misspelling .The Smithsonian Institution's Global Volcanism Program cites the Indonesian name, Krakatau, as the correct name but says that its spelling as Krakatoa is also often used. 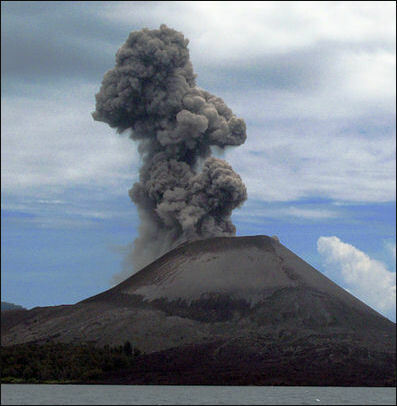 Anak Krakatau (50 kilometers west of West Java) is a small, extremely active volcano that rose from the ocean and disappeared five times before it established itself as a permanent island in 1930. Situated in the middle of a huge submerged caldera and approximately 100 meters high, the island was created after Krakatau collapsed during the famous cataclysmic eruption of 1883 that killed over 36,000 people and sent eleven cubic miles of debris flying into the atmosphere. Anak Krakatau means “Child of Krakatau.” It has been very active since 1972 but tourist boats will take you there. In the late 1980s I talked to a group of travelers who went there and walked up to the crater which, at the time, was quiet. While they were standing there the mountain started to erupt and the they had to dash for their boats while fist-size volcanic bombs plummeted around them. In the 1980s, most trips to Anak Krakatau were arranged from Carita and sometimes from Bandar Lampung or the small prot of Kalianda. The advantage of Carita was that more travelers went there and you were more likely to rustle up enough people to charter a boat at a reasonable price. There were organized tours from Carita but often they didn’t get enough people so travelers had to charter a boat. Boats of all kinds could be charters but it was in your self interest to get one that was seaworthy. The seas off Krakatoa can be quite rough and many travelers have got stuck in boats whose engines conked out at sea. The crater areas is generally regarded as too dangerous to visit. Travelers to Anak Krakatau generally climb a few hundred meters up the mountain but not ascend all the way to the crater and then visit some nearby islands. Setting foot on an active volcano is certainly a one of a kind sensation, and if fortunate enough, visitors can watch as the Anak Krakatau volcano presents its active side. “Born” in 1927, the young volcano still frequently ejects smoke, lava and other volcanic materials as it continues to grow higher. The marine environment around the island offers its own attraction as it holds no less than 50 species of fish that live among its unspoilt coral reefs. From Bandar Lampung: From Bandar Lampung you can take a bus from Rajabasa or Panjang terminal in the direction of Kalianda, South Lampung districts for approximately 45 minutes. There you can continue your trip by public transportation mini buses (angkutan kota) taking about 10 minutes to Canti Village. Once you are in Canti village, heads to its pier where you can rent a fast boat (Jetfoil) or regular motor boats. If you use a fast boat, the journey will take approximately 90 minutes to get to Krakatau Islands Nature Reserve, while using regular motor boats, the trip will last approximately 150 minutes. From Jakarta: The fastest way to get to the islands from Jakarta is by chartered Jetfoil or fast boats or alternately cruise ships from Tanjung Priok Bay straight to the Krakatau Islands. If you are adventurous enough, you can take the public transportation route. Start by taking a bus at the Kalideres Terminal in direction of Merak Harbor in Banten Province which will take roughly about 1.5 hours. From the Merak Harbor you will need to take a ferry across the Sunda Straits that will take you to Bakauheni Harbor on Sumatra. Depending on the weather and traffic conditions, the ferry ride will take about 1 to 2 hours. From The Bakauheni Harbor you can charter public transport that will take you to Port Tanjung Bom. From Tanjung Bom you can find many rented boats that can take you to Sabesi Island as a transit point before heading to Krakatau Island. From Sabesi Island to Krakatau Islands is about a 2 hour boat ride.